The Carolina Panthers are 3-6 this season, and the New Orleans Saints are 4-5, these are the two teams that will face off Thursday Night Football at Bank of America Stadium. The Saints are coming off a really bad loss, and the Panthers are coming off a gut-wrenching defeat, but the short week is forcing both teams to hit the reset button and quickly get over their bad memories of Sunday’s game and get ready for a critical game in the NFC South. These rivals will jostle for positioning behind the first-place Atlanta Falcons who are 6-4, with seven games left to play. New Orleans will come into tonight’s game following up on a crushing loss on home field. Everyone was sure that the Saints would win following QB Drew Brees’ 32-yard touchdown pass to Brandin Cooks to tie the score with less than a minute and a half to play. But instead of successfully kicking the extra point to pull ahead, Justin Simmons was able to jump over the center and block it. Will Parks grabbed it for the rare two-point conversion to put the Broncos back in front and eventually win the game. The Saints were unable to recover the ensuing onside kick, which let Denver run out the clock. Everyone in the Carolina locker room knows that situation pretty well too, and what’s at stake in tonight’s game. “No question. We’ve put ourselves in a real desperate situation,” linebacker Thomas Davis said. “The only people that can dig us out of it is us.” The Panthers who have been the NFC South’s champions three years in a row are still looking for their first win in their division this season, so they are obviously off their game. This will be the first division game for Carolina since a an exciting and furious second-half comeback against the same Saints, in a Week 6 game that eventually came up short in a 41-38 defeat. The Panthers gave up more than 500 yards against quarterback Drew Brees and the Saints’ top-ranked offense in that game, but since their defense has been a lot better, forced to improve in the three games since. So Carolina will be ready. A healthier, more confident Carolina defense looked like they turned the corner after their bye week in Week 7. The extra rest probably paid off, but now Carolina’s offense will want to bounce back too after not being able to score a point in the second half in last week’s 20-17 loss against the Kansas City Chiefs. In that loss against Kansas City, it became obvious it was just another typical game of the Panthers’ so far disappointing season. With the game tied at 17 following 14 unanswered fourth quarter points by the Chiefs, Carolina had the ball at its own 20-yard line with just 29 seconds left. Cam Newton completed pass to Kelvin Benjamin, who got stripped by Marcus Peters, setting Kansas City up in field goal position. Two plays and two timeouts later, Cairo Santos jacked the 37-yard field goal to give the Chiefs another comeback win. For the Panthers, it symbolized just another way to lose as the defending NFC champions fell to 3-6 record, when less than a year they started the season 15-0. “We want to take each possession and maximize it – whether it’s the first possession, the sixth possession or the last possession. We want to play well from the jump and sustain that throughout,” Carolina’s tight end Greg Olsen said. “We understand we have to score, we have to hold the ball. We can’t give (the Saints) short fields. I think a lot of those principles apply every week.” They are a team with four losses which were all decided by a field goal or less, so the time is now for Carolina to find a winning streak before it’s really too late. 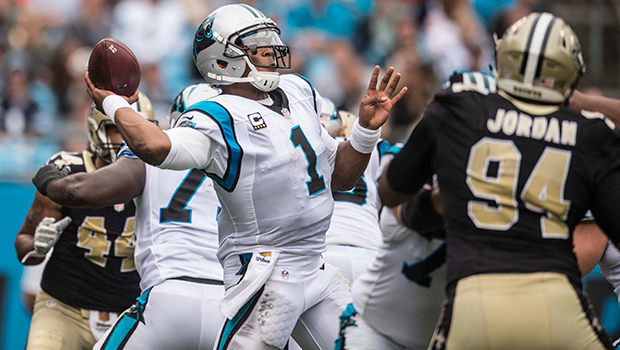 “We have to be better,” said Panthers quarterback Cam Newton. “When it’s time to win, we just have to grit our teeth and find ways.” It’s hard to believe they were in a Superbowl not too long ago. New Orleans beat Carolina 41-38 at home back in Week 6 so the Panthers will want revenge, and they have the slight edge since they lead the all-time series 23-20 although the games played in Charlotte were spilt (10-10). Carolina has had the upper hand recently, winning six of the past nine matchups overall, and they’ll want that trend to continue. But can they?